Lamberts Point Lighthouse was built in 1872 on the shore of the Elizabeth River in Norfolk, Virginia. It was a square screwpile set on five piles. The house was brown in color and the lantern had a red light of the fifth order. The foundation settled unevenly, perhaps due to the missing sixth pile, and the lighthouse sat at a tilt about fourteen inches lower on the west side. More piles were added to the foundation to stabilize the structure. 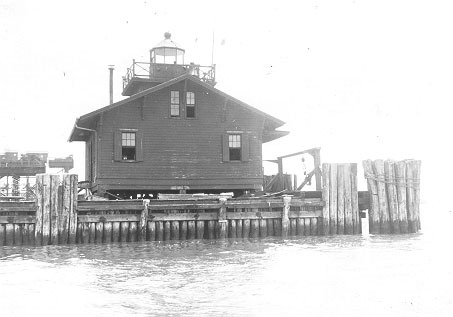 During the stabilization process a dock from the shore and a pier were added to the lighthouse. Eventually the lighthouse became useless as an aid to navigation as the construction of piers and warehouses, built by The Norfolk and Western Railroad increased around it. The light was decommissioned on December 31, 1892, the same year that nearby Bush Bluff, located just north of Lamberts Point on the Elizabeth River, was marked with a lightship. In 1901 the fog signal was reestablished and provided service for the next 10 years. The building collapsed around 1911. Photo courtesy US Coast Guard.